One Rule is an simple method based on a 1‐level decision tree described in 1993 by Rob Holte, Alberta, Canada. with this one-level decision tree, 10 instances are correct on 14. 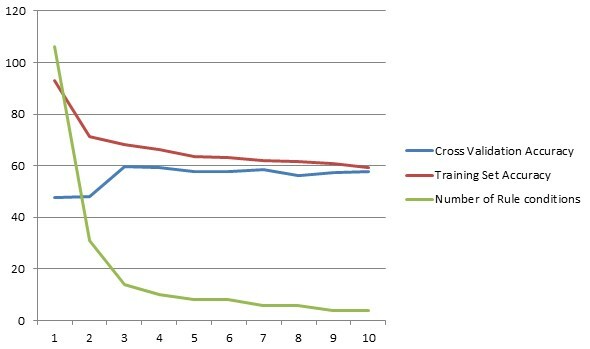 3. make a rule "if attribute=value then class=c"
With one “minBucket size” the accuracy on the training data set is really high and decreases whereas the “minBucket size parameter” increases. The cross validation evaluation method (10 folders) limits the accuracy effect and make it more stable through the “minBucket size” values. Residual sum of Squares (RSS) = Squared loss ?